We all get bombarded with too many messages every day. From commercials and billboards, to text messages and emails, we have information coming at us all day long. Heck I have 7 or more email addresses, but I have setup a simple system to where I only see a few emails per day of the hundreds I receive. When it comes to your inbox you are in control of what messages you receive and how and when you see them, so its time to take control and simplify your digital life and clean up your email box. 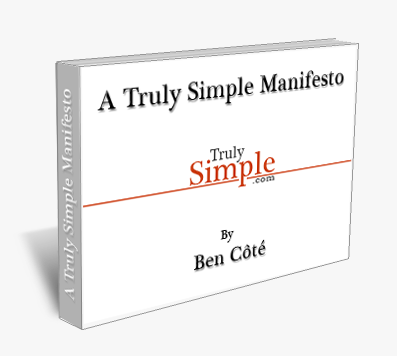 Your Truly Simple Action of the week is to take control of your inbox. Here are 5 simple ways to do just that. First you need to unsubscribe to every email that is not providing you value. If you aren’t getting valuable information from the emails coming into your inbox, stop getting them. Every email you get from a company has an unsubscribe link in it somewhere. They are usually at the bottom, but can sometimes be a little tricky to find. Go through your inbox this week and as you get emails in that you no longer wish to receive, simply unsubscribe from them. Do this each day this week. By the end of the week you should have at least 90% of the unwanted emails stopped. This is a quick and easy process that only takes a few seconds per email and you only have to do it once. Next, when you are getting emails you really want to get, it’s time to filter them appropriately. I’m using Gmail as my email, but most email clients offer this same functionality. If yours does not, switch to gmail. You can set up whatever filters make sense for you, but start with a few categories and you can always add more as they make sense. Now with those filters set up, it’s time to use them. 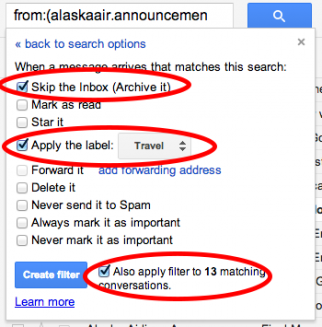 Filter all those types of messages so they get filtered and skip the inbox. Yes I still get those messages, but I don’t see them until I want to see them. This is the key to managing your email. You can still get all the sales emails you want, but you don’t need to see them until you are ready to shop. This is the best of both worlds. When I am ready to buy something I search through my email for some deals or discounts, but otherwise I am not having to look at ads and sales that do not interest me. This also works great for when we want to go out to eat, I can check my restaurant filter and see if any of my favorite restaurants are having any coupons or deals. Next check the box to skip the inbox. We don’t need to see these messages in our inbox, thats why we are filtering them. Then check the box to apply your label. Select the appropriate label or create one. I filter all my airlines emails into my Travel filter. 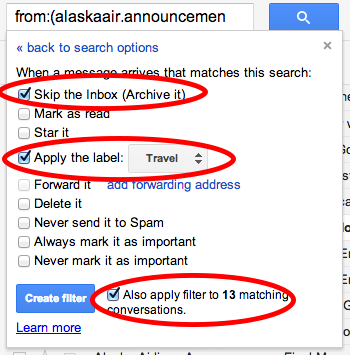 Then check the box to apply that filter to all those messages that match that filter. Then finally click the Create filter button. That’s it! This whole process takes only a few seconds once you get the hang of it and you only have to do it once per email sender and then all of those emails will now get filtered for you. Ok, once you filter out all the business email your inbox should be only getting messages from family and friends. This is a simple and awesome inbox. It should be filled with personal communications of people you actually want to talk to. This is a good place to be, but we can get better. Its time to clean out the inbox again. Don’t worry we aren’t going to delete all your email, we are just going to archive it. 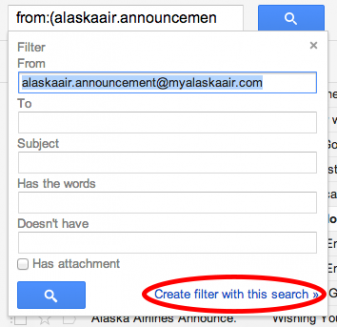 Archiving, lets us get all that email out of the inbox, but saves it for searching later. You can always go back and find any email you wish, but we don’t need to keep it in our inbox. This one is easy, simply check the box to select all the mail (1) and then click the text link to select everything (2), and then click the archive button (3). This is a clean inbox. Take a moment and revel in its beauty. Now don’t freak out, all your email is still there and you can search for it anytime you need it, but now you have a clean starting point to which you can be organized. I archive all of my email every friday. So at the end of each week, I take everything, and get it out of the way. A clean slate is a nice way to end the week. Now that you’ve got your inbox under control its time to control your smart phone. Turn off all push functions and notifications for email. It is YOUR email and YOU are in control of when you want to check it. Don’t let that little phone push you around and teach you to respond to every beep and buzz in your pocket like a trained monkey. Turn off push email so your email only comes in when you want it it to. Second, turn off all notifications so again, you get to check email when you want to. You are in control! And one last tip on email. Do not check it first thing in the morning. This is hard as you might use your phone as an alarm clock right next to the bed as I do. I also still struggle with this one, but its important. DO NOT check your email first thing in the morning. Just as you are taking control of your inbox, you take control over when you check it. Checking it first thing in the morning is a really bad idea as it tends to hijack your day and you haven’t even gotten out of bed yet. When you check your email first thing in the morning you are giving permission to everyone who has emailed you to give you marching orders for the day verses doing what you wanted to do. You will want to respond to any fire drill you find in your inbox and that is not a good way to start the day. Don’t check your email. It will be there later. Do what you want to do first. Get done the things on your to do list first. Those fire drills will be there later and you can take care of them later if they haven’t already sorted themselves out. Don’t let others dictate your day. Remember, you are in control. This is your inbox. This is your life. I hope you take some time this week to accomplish this Truly Simple Action and see how these simple rules for email can make your life better. Get out of your inbox. 3 steps to email independence.